Welcome to Ko Lanta the secret island of Thailand. 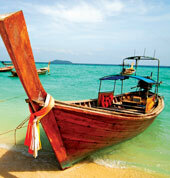 Ko Lanta lies in the Andaman Sea, 70 km south of Krabi Province, southern part of Thailand. If you are searching the sea breeze, sunny, white sand and beautiful beach, here is match with you. Ko Lanta is the new destination for tourist and not booming yet. The business here is still not much commercial like in big cities, mostly run by small local family. Ko Lanta achipelago contain over 70 small islands nearby. There are many interesting islands for canoeing, skin diviing and scuba dive.